Illustration of herbicide drift. 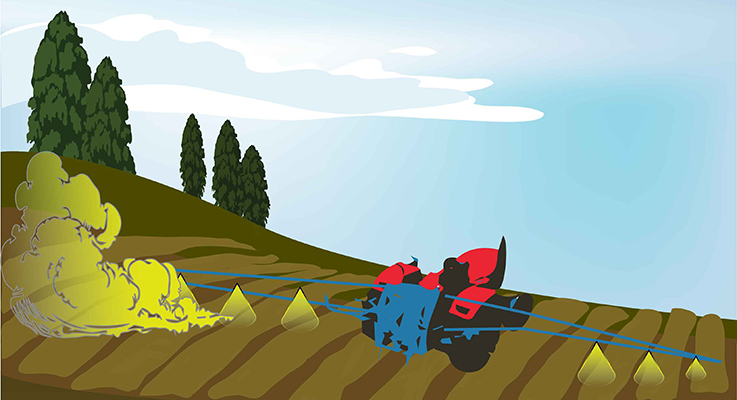 In the graphic, a tractor with boom sprayer is applying herbicides, colored yellow, to a bare soil field. Drift is the movement of physical particles as droplets or dust to unintended areas, and is pictured as the yellow cloud moving away and to the left. Drift is influenced by environmental and cultural conditions, such as wind, temperature and spray nozzle size. Herbicides are the most commonly used form of pesticide in the United States, and they are an integral component of most nursery production systems. In many cases, herbicide use has increased production efficiency and profitability as herbicides help reduce the need for hand labor. The increasing use of herbicides has resulted in unintentional herbicide movement into non-targeted areas. According to one large study, “Pesticides in the Nations’ Streams and Ground Water, 1992–2001,” the U.S. Geological Survey observed that 97 percent of all streams sampled from agricultural and urban areas were contaminated by herbicides. Once applied, the fate of herbicides can follow a few different pathways, including: plant uptake, decomposition by microorganisms or ultraviolet light, leaching into the soil, surface transport by water, and aerial loss through pesticide drift and volatilization. The pathway of transport, as well as the distance of transport, is highly dependent on the property of the chemicals used, the application methods and the environmental conditions, including temperature, wind and rainfall. In this article, we will focus on drift and volatilization, because they represent the greatest pathway for loss, and they pose a significant threat to non-target plants and people. Herbicide drift, like any pesticide drift, is the movement of physical particles as droplets or dust to unintended areas. Volatilization, or “vapor drift,” occurs after the application, when herbicides transform into gaseous states and are carried away on wind into the atmosphere. The prevalence of herbicides in freshwater sources has led many to believe that runoff or groundwater leaching were the primary transport pathways. However, recent studies have revealed that aerial transport is a greater pathway of off-site contamination. Reviews of the topic suggest the fate of herbicides after application are typically less than 1 percent lost to groundwater leaching. Approximately 1–4 percent is carried away in surface runoff, with losses via drift and volatilization ranging between 5–25 percent, frequently exceeding 10 percent. Therefore, it is worth understanding factors influencing volatilization, because 25 percent losses not only represent an environmental hazard, but are a waste of money and resources as well. For many years, it has been assumed that volatilization was primarily related to the chemical properties of the herbicide ingredient. This chemical relationship was commonly explained by Henry’s law, which was formulated in 1803 by the chemist William Henry. In general, Henry’s law relates dissolved gas in a liquid phase to the partial pressure in a gas phase. This law is relevant to herbicides because it was used to predict volatility, especially when paired with vapor pressure and temperature. Vapor pressure is the measurement of the tendency of an herbicide to move to a gaseous form. The greater vapor pressure, the greater the tendency to volatilize. What was not taken into account is that herbicides are not the only chemicals in a production system. More specifically, dihydrogen monoxide (aka water) also plays a significant role in the volatility and fate of the herbicide. For example, metolachlor, a pre-emergent herbicide used to control yellow nutsedge and other grassy or broadleaf weeds, has a low Henry’s law constant and a low vapor pressure, and is therefore predicted to have very little losses to the atmosphere by volatilization. Yet, recent USDA research reporting from a 13-yearlong study showed that metolachlor volatilization commonly exceeded 20 percent, and was significantly related to soil moisture. The more moisture in the environment, the more likely for the herbicide compounds to be transported into the atmosphere. Therefore, as with most things, timing is everything. Volatilization is dependent on herbicide chemical properties and its formulation properties, as well as soil, plant and weather conditions. Most herbicide volatilization occurs in the first hours or days after application. For metolachlor, researchers found that that waiting two days after irrigating before applying herbicides could reduce volatilization by more than 50 percent, with rates of volatilization decreasing exponentially each day. In irrigated areas, the application of water must be coordinated with herbicides to reduce runoff or volatilization. In rain-fed regions or seasons, look for breaks in the storms. In broad strokes, volatilization is higher in sandy soils, moist soil and under higher temperature. Sandy soils have generally lower organic matter content and lower cation exchange capacity (CEC), thus having fewer sites to bind the herbicide in the soil. High soil moisture content would have water molecules taking binding sites and result in more herbicide free in the soil. Higher air and soil temperature also increase the volatilization rate, partially because herbicide vapor pressure property is temperature dependent. Formulation properties play an effect, too. For instance, the 2,4-D herbicide is commonly alluded to as a volatile compound, and the 2,4-D esters formulations are indeed highly volatile. However, amine and choline formulations are not a significant volatile compound. Herbicide drift during application and volatilization following application is an important topic for the nursery industry, because aerial transport can result in substantial injury to non-target crops and non-crop vegetation. Caution must, of course, be exercised within one’s own nursery, and it is important for growers who are embedded in a larger agricultural matrix. Drift from a neighbor’s field or farm is critical for the nursery industry, because mild injury can affect the value and marketability of plants judged on aesthetic appeal. For example, 2,4-D is commonly applied to control broadleaf weeds in field crops and pastures, as well as forestry operations. Drift from 2,4-D can cause deformed or denuded spring flush foliage. Volatilization and drift of metolachlor and other pre-emergent herbicides that suppress synthesis of chlorophyll and other essential compounds can lead to non-target chlorosis and deformities. In extreme cases, drift can kill non-target species. The damage may be visible for short periods if leaf turnover is rapid, or for long periods if leaves are persistent. Herbicide drift can cause injury to all plant parts, leaves, stems, flowers and fruit. Injury symptoms include mottled and interveinal chlorosis, purpling of the leaves, leaf curl, leaf necrosis, and stem or tip dieback. The response is dependent on the plant species, herbicide and exposure dose. To fill gaps in knowledge, Dr. Nackley is participating in the USDA led IR-4 program to facilitate regulatory approvable of pre-emergent herbicides for a number of ornamentals grown in Oregon. He had generous donations of plant species from Bailey’s Nursery Inc., Monrovia Inc. and Willamette Nursery. He was able to purchase beautiful specimens from a number of other OAN growers as well. The goal of this research is to provide growers with new chemical alternatives. Unfortunately, there is limited information on herbicide injury of ornamentals. Dr. Moretti is leading a project that will create a herbicide injury database for nursery crops. This will be a large, online collection of photographs showing different herbicide damage on important nursery crops. The aim is to provide growers and managers with a tool so that they may be able identify if herbicide drift is impacting their production. In the meantime, an existing resource for identification of herbicide drift symptoms is available online at http://herbicidesymptoms.ipm.ucanr.edu. If you are concerned about herbicide drift, the first step would be to look for patterns in the field. Document symptoms by taking pictures and collecting samples for laboratory analysis. Contact the Pesticide Analytical and Response Center at www.oregon.gov/ODA/programs/Pesticides/Pages/PARC.aspx. Herbicide drift and volatilization can be controlled through good management. Natural conditions will affect the timing and application. In general, hot windy conditions are the worst conditions to spray, because of the likelihood for herbicides to be carried away in the atmosphere. Another important consideration is the surface soil moisture. In irrigated areas, the application of water can be coordinated with herbicides to reduce runoff or volatilization. Another factor that can reduce volatilization is the use of adjuvants, which are any substance added to the spray tank to improve activity or application characteristics. Many people are familiar with adjuvants like buffering agents, antifoams or surfactants. Recent research has shown that certain adjuvants with certain chemicals can reduce volatilization by 50 percent. This work focused on pesticides, but the theoretical basis for application with herbicides is sound. Another aspect of herbicide spray that deserves more attention from applicators is the spray droplet size, because droplet size is one of the biggest contributors for managing spray drift. Droplet size is measured by the diameter of the droplet, usually reported in microns. The American Society of Agricultural Engineers classifies droplet size as very fine (less than 100 microns), fine (100–175 microns), medium (175–250 microns), coarse (250–375 microns), very coarse (375–450 microns) and extremely coarse (greater than 450 microns). Droplet size impacts the distance the droplet will move away from the spray nozzle. A very fine droplet (100 microns) travels 44 feet away from the spray nozzle in a 3 mph wind and takes 10 seconds to reach the ground. In contrast, a coarse droplet (400 microns) travels 8.5 feet away from the spray nozzle and falls to the ground in 2 seconds. Drift control nozzles can generate coarse to very coarse droplets with great uniformity without compromising application performance. Appropriate nozzle selection can greatly reduce drift with minimal cost. Many steps can be taken to minimize herbicide drift and we will briefly mention a few. • Plan the application. The first step is to avoid application near sensitive crops. If not possible, avoid spraying when the neighboring crops are most sensitive (e.g., during the growing season). Also, do not spray when wind conditions are blowing towards the sensitive crop. • Be aware of weather conditions. Spray when wind conditions are ideal, between 2–4 mph. Wind speeds greater than 6 mph greatly increase drift chances. It is not advisable to spray when wind speeds are greater than 9 mph. • Watch for temperature inversions. Inversions occur when the air close to the ground is colder than the air above — the inverse of normal conditions. Inversion happens more often at dusk and dissipates during sunset. North Dakota University has a fact sheet with more detailed information (www.ag.ndsu.edu/pubs/plantsci/pests/ae1705.pdf). • Use drift control adjuvants. These types of adjuvants can help reduce drift by increasing viscosity of spray solution, thus creating larger droplet sizes. Larger droplets are less prone to being moved off-target. For a more complete list, refer to the website developed by Dr. Kassim Al-Khatib (herbicidesymptoms.ipm.ucanr.edu). The authors are currently seeking research opportunities to study herbicide volatilization at a field scale. Studying herbicide drift is as challenging as finding the optimal window to spray. For this reason, there is a paucity of information on the non-target effects of herbicides on many specialty crop species. The overarching goal from their collaboration will be to develop a comprehensive weed management program that will provide nursery growers with information and tools to improve herbicide best management practices and minimize herbicide drift. Houbraken, M., et al. (2015). “Influence of Adjuvants on the Dissipation of Fenpropimorph, Pyrimethanil, Chlorpyrifos and Lindane on the Solid/Gas Interface.” Chemosphere 138:357–363. Liebman, M., et al. (2016). “Ecologically Sustainable Weed Management: How Do We Get from Proof of Concept to Adoption?” Ecological Applications 26:1352–1369. Prueger, J. H., et al. (2017). “Multi-Year Measurements of Field-Scale Metolachlor Volatilization.” Water, Air, & Soil Pollution 228:84.